Continuing on from the ‘Ram’ Kangaroo Armoured Personnel Carrier, Part 1, of 16 October 2014. b.) – enable infantry to reach their objective more rapidly that at present possible by use of (i) armour protection to allow them to get closer to our own bomber targets whilst the latter are still being attacked. (ii) speed of the vehicle to reduce the time taken to reach the objective from the start line. It was also agreed, that the squadrons of armoured personnel carrier regiments, must be organized to lift complete infantry battalions or subunits thereof. Therefore, it was agreed that an armoured personnel carrier regiment be organized and consist of a Regimental headquarters and two squadrons, with each squadron consisting of a Squadron headquarters with five armoured personnel carriers, an Administration Troop and four Troops, each consisting of a Troop headquarters with three armoured personnel carriers and three sections, each with three armoured personnel carriers. It was also agreed, that each armoured personnel carrier regiment, should also have a reserve of 12 additional armoured personnel carriers, one for each of the regiments eight Troops, and two per squadron, and that squadrons, as far as possible, were to be administratively self-sufficient. Each regiment was to have an attached Light Aid Detachment (one officer and 52 other ranks, consisting of a headquarters and two sections, one section to each squadron) and a Signal Troop (one officer and five other ranks). The strength of each regiment was to be 25 officers and 522 other ranks (including the Light Aid Detachment and Signal Troop). The possibility of adding two more squadrons to each regiment was also discussed, and it was agreed that this would be put off for the time being. Eventually, the proposed two additional squadrons per regiment were dropped. With Headquarters 21st Army Group having come to the decision that two armoured personnel carrier regiments would be formed, one in the First Canadian Army, and the other, in the Second British Army, First Canadian Army Headquarters, informed Canadian Military Headquarters (London), on 14 October, that 162 ‘Ram’ Kangaroo armoured personnel carriers would be required to form the Canadian armoured personnel carrier regiment, consisting of two squadrons of 53 carriers each, and a reserve of 50 armoured personnel carriers. On 19 October 1944, Brigadier C.C. Mann, the Chief of Staff, First Canadian Army Headquarters, sought out the approval of Lieutenant-General G.G. Simonds, the Acting/General Officer Commanding -in-Chief, First Canadian Army1, for the authority to disband the 1st Canadian Armoured Personnel Carrier Squadron, Canadian Armoured Corps, and the Light Aid Detachment 1st Canadian Armoured Personnel Carrier Squadron, Royal Canadian Electrical and Mechanical Engineers2. At the same time, the authority to form the 1st Canadian Armoured Personnel Carrier Regiment, Canadian Armoured Corps, 1st Canadian Armoured Personnel Carrier Regiment Signal Troop, Royal Canadian Corps of Signals, and No. 123 Light Aid Detachment (Type E), Royal Canadian Electrical and Mechanical Engineers, was also asked to be approved. Having obtained Lieutenant-General G.G. 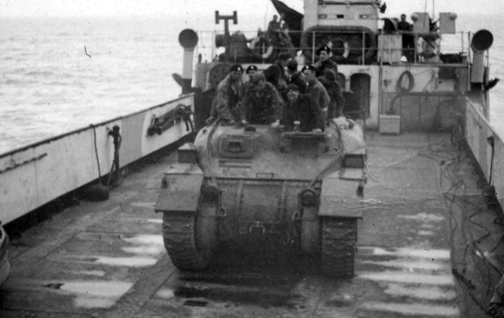 Simonds’ approval, 1st Canadian Armoured Personnel Carrier Squadron, Canadian Armoured Corps, and the Light Aid Detachment 1st Canadian Armoured Personnel Carrier Squadron, Royal Canadian Electrical and Mechanical Engineers, were disbanded, effective 11:59 P.M., 23 October 1944. At the same time, the 1st Canadian Armoured Personnel Carrier Regiment, Canadian Armoured Corps, 1st Canadian Armoured Personnel Carrier Regiment Signal Troop, Royal Canadian Corps of Signals, and No. 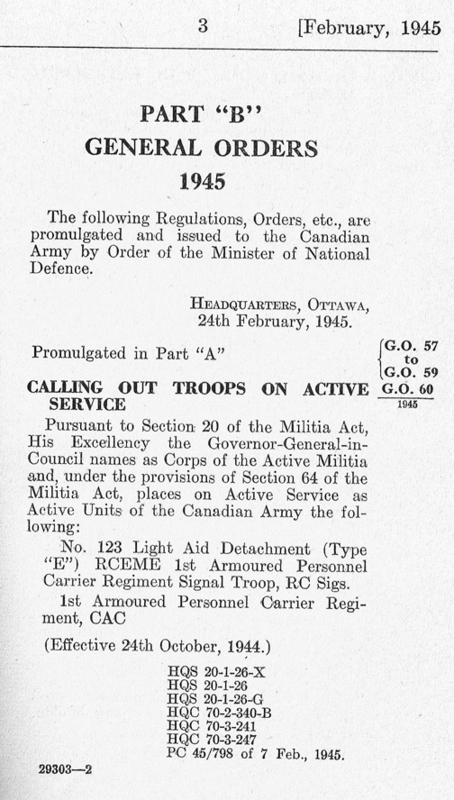 123 Light Aid Detachment (Type E), Royal Canadian Electrical and Mechanical Engineers, were authorized to be formed, with effect from 00:01 A.M., on the morning of 24 October 1944. 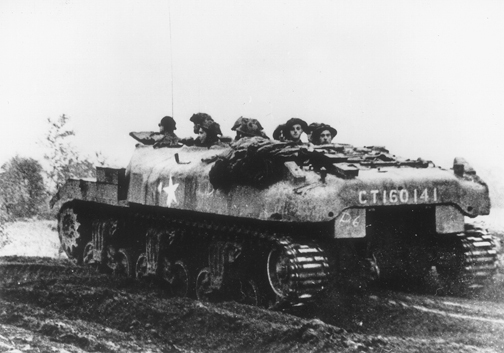 Although, as stated above, 1st Canadian Armoured Personnel Carrier Squadron, Canadian Armoured Corps, was disbanded, effective 11:59 P.M., on 23 October 1944, but, since they were at that time involved with active operations, in support of the British 15th (Scottish) Infantry Division, in the Moergestel, (Holland) area, they were in reality, absorbed into the newly created Canadian armoured personnel carrier regiment, as “A” Squadron, 1st Canadian Armoured Personnel Carrier Regiment, Canadian Armoured Corps, under command of Captain Corbeau. Lieutenant-Colonel G.M. Churchill3 was appointed Commanding Officer, 1st Canadian Armoured Personnel Carrier Regiment, Canadian Armoured Corps, with Major F.W.K. Bingham4 being appointed Second-in-Command5. Lieutenant D.H. Simpson6, Royal Canadian Corps of Signals, was appointed Officer Commanding, 1st Canadian Armoured Personnel Carrier Regiment Signal Troop, Royal Canadian Corps of Signals, with Captain W.T.E. Duncan7, Royal Canadian Electrical and Mechanical Engineers, being appointed Officer Commanding, No. 123 Light Aid Detachment (Type E), Royal Canadian Electrical and Mechanical Engineers. On 24 October, Regimental Headquarters, 1st Canadian Armoured Personnel Carrier Regiment, was established in Antwerp (Belgium), to begin the process of organizing the regiment, with new personnel for the regiment being quartered in Rumst (Belgium), under control of Major Bingham (the regiment’s second-in-command), as they arrived to fill-up the positions in the organization of the regiment. 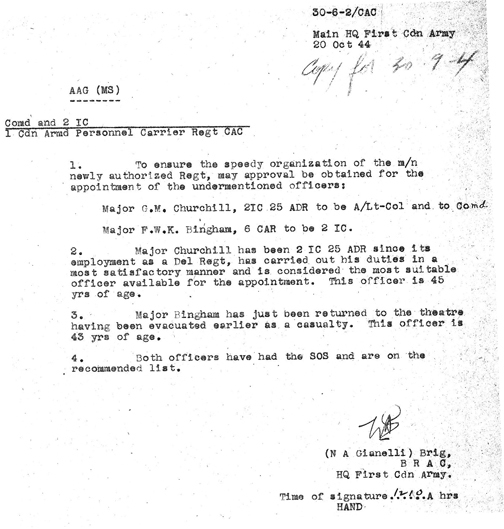 On 28 October, Lieutenant-Colonel Churchill was informed that the regimental organization was to be completed by 6 November, followed, on 29 October, by the news that the regiment was to come under command of Second British Army on 1 November 1944. 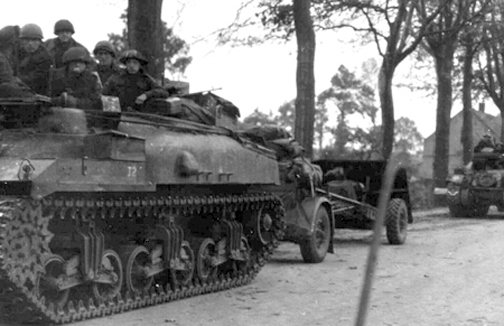 Arrangements were set in motion for the whole of 1st Canadian Armoured Personnel Carrier Regiment, to concentrate in the area of Tilburg (Holland). “A” Squadron’s support of 15th (Scottish) Infantry Division operations having been completed, were concentrated at Tilburg (Holland) on 30 October. Also, on 30 October, 1st Canadian Armoured Personnel Carrier Regiment, was informed by First Canadian Army Headquarters, that 106, .30-calibre Browning machine guns, had been released to the regiment, and were awaiting pick-up at 3 Sub Depot, 14 Advanced Ordnance Depot, Royal Army Ordnance Corps8. These additional .30-calibre Browning machine guns, were to be mounted, one a piece, on the outer edge of the circular hole left in the hull top, by the removal of the turret during conversion, on each of the regiment’s 106 ‘Ram’ Kangaroo armoured personnel carriers. The idea, was to use one of the bolt holes left by the removal of the turret ring, as a mounting point for the machine gun. These guns were picked up by the regiment on 1 November, from which point, Captain S.F. Rook, the regiment’s Technical Adjutant9, and Captain Duncan, Officer Commanding, No. 123 Light Aid Detachment (Type E), Royal Canadian Electrical and Mechanical Engineers, set about to devise a suitable device for the mounting of these guns, on the outer edge of the circular opening in the hull top of the regiment’s 106 ‘Ram’ Kangaroo armoured personnel carriers. In an effort to minimize the potential hazard of infantrymen being exposed to shell splinters, or enemy fire, through the circular opening in the hull top of the ‘Ram’ Kangaroo armoured personnel carrier, while aboard, No. 2 Canadian Tank Troops Workshop, Royal Canadian Electrical and Mechanical Engineers, devised a two-foot (one-metre) high shield, which fitted around the forward edge of the circular opening in the hull top. Major Bingham (the regiment’s second-in-command), inspected a ‘mock-up’ of this shield, which was fitted to one of the regiment’s ‘Ram’ Kangaroo armoured personnel carriers, at No. 2 Canadian Tank Troops Workshop, on 27 October 1944. This proposed modification, however, was never adopted. On 1 November, “A” Squadron was split into two squadrons, “A” Squadron, with Major Corbeau still commanding and “B” Squadron, under command of Major H. Baldwin10. 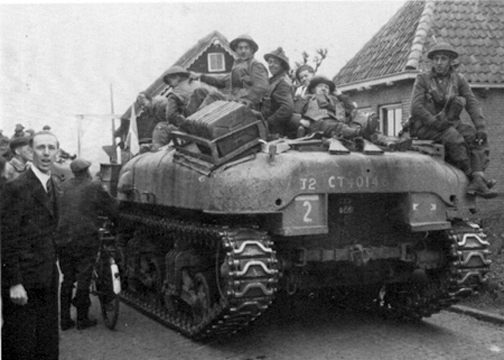 By 2 November, all of 1st Canadian Armoured Personnel Carrier Regiment was concentrated in Tilburg, along with both No. 123 Light Aid Detachment (Type E), Royal Canadian Electrical and Mechanical Engineers, and the 1st Canadian Armoured Personnel Carrier Regiment Signal Troop, Royal Canadian Corps of Signals. On 5 November, the overall strength of the regiment stood at 23 officers and 268 other ranks, holding a total of 85 ‘Ram’ Kangaroo armoured personnel carriers. All of November was spent in Tilburg, organizing and getting the regiment ‘battle worthy’ for future operations, with maintenance being carried out on the carriers, which included the 100-hour check11 (an overhaul), since the ‘Ram’ Kangaroo armoured personnel carrier, was powered by a 450-horse power Continental R975/C1 radial air-cooled 9-cylinder engine, and on the incoming ones that dribbled in all month from Ordnance issues. Since the ‘Ram’ Kangaroo armoured personnel carriers, which 1st Canadian Armoured Personnel Carrier Squadron had been issued with back in October, had been converted and shipped to Normandy for issue, there had been no time for proper maintenance to have been carried out on them. Once landed in Normandy they were to have been ‘lifted’ by either rail or tank transporter to the point of issue to 1st Canadian Armoured Personnel Carrier Squadron, but ended up being driven from the Normandy coast to Pierreval (France), and once issued to the squadron, were committed right into ‘active’ operations, so it wasn’t until the coming together of all of 1st Canadian Armoured Personnel Carrier Regiment, in Tilburg, that the opportunity finally arose for full and proper maintenance to be carried out on these carriers. Captain Duncan’s, No. 123 Light Aid Detachment (Type E), Royal Canadian Electrical and Mechanical Engineers, were aided by the British 821, and 826 Tank Troops Workshops12, Royal Electrical and Mechanical Engineers, throughout the mouth of November, with both the 100-hour checks, and in doing minor repairs, on the regiment’s ‘Ram’ Kangaroo armoured personnel carriers. Captain Duncan, was also able to acquire much needed spare parts from both No. 2 Canadian Tank Troops Workshop, and No. 4 Canadian Armoured Troops Workshop, Royal Canadian Electrical and Mechanical Engineers13. 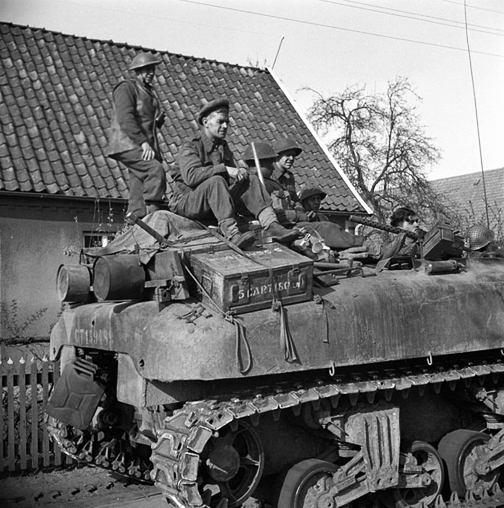 1st Canadian Armoured Personnel Carrier Regiment Signal Troop, Royal Canadian Corps of Signals, was also kept busy throughout the month of November, in not only organizing themselves, but also in, insuring that all of the regiment’s communications equipment was in working order, and that all personnel of the regiment, who would be operating wireless sets (radios), knew the proper procedures, for there use. Eventually all of the regiment’s ‘Ram’ Kangaroo armoured personnel carriers, was fitted with a No. 19 Wireless Set, with other designated carriers being fitted with a second No. 19 Wireless Set, or with No. 18, No. 22, or No. 38 Wireless Sets, as the need arose. 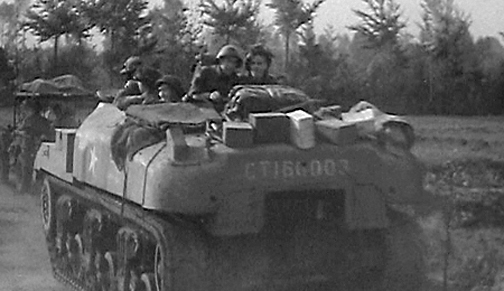 In an effort to better improve the supply of spare parts and other essentials that the Signal Troop required, to keep the communications equipment of 1st Canadian Armoured Personnel Carrier Regiment, in working order, on 4 February 1945, 1st Canadian Armoured Personnel Carrier Regiment Signal Troop, formally became a part of No. 4 Company, First Canadian Army Signals, Royal Canadian Corps of Signals, although the remained attached to 1st Canadian Armoured Personnel Carrier Regiment. On 9 December 1944, the design for the secondary .30-calibre Browning machine gun pintle mounting device and feed tray (which held one box of .30-calibre belted ammunition), that Captain’s Duncan, and Rook, had designed was approved by First Canadian Army Headquarters, with a pilot model being ready for inspection by both, on 14 December, at No. 1 Canadian Advanced Base Workshop, Royal Canadian Electrical and Mechanical Engineers, Brussels, Belgium. 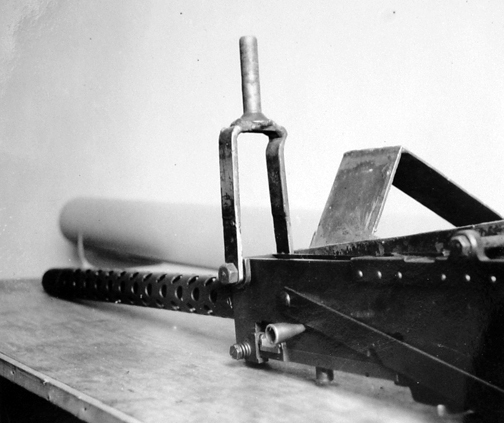 These mounts, were immediately ordered into production, by the Deputy Director of Mechanical Engineering, First Canadian Army14, with him directing that No. 1 Canadian Advanced Base Workshop, produce 130 of these mountings, so as a reasonable reserve could be held, to replace battle damaged ones. On 30 December, 1st Canadian Armoured Personnel Carrier Regiment, received 110 mounts, with the remainder to follow. Some of the regiment’s ‘Ram’ Kangaroo armoured personnel carriers, were eventually fitted with a third .30-calibre Browning machine gun, or with a single .50-calibre Browning heavy machine gun M2, in the turret ring. On 20 December, 1st Canadian Armoured Personnel Carrier Regiment, along with their attached Light Aid Detachment (No. 123), and Signal Troop, were placed under command of the British 79th Armoured Division15, with the regiment becoming part of the British 31st Tank Brigade16, which at the time, consisted of the British 141st Regiment (The Buffs), Royal Armoured Corps (equipped with Churchill Crocodile flame-throwing tanks), the British 1st Fife and Forfar Yeomanry (equipped with Churchill Crocodile flame-throwing tanks), and the British 49th Armoured Personnel Carrier Regiment (equipped with ‘Ram’ Kangaroo armoured personnel carriers). 1st Canadian Armoured Personnel Carrier Regiment (along with their attached Light Aid Detachment, and Signal Troop), were the only Canadian unit, to serve as part of the British 79th Armoured Division. It was also on 30 December, that the decision was taken, to hold in abeyance, the matter of the proposed expansion of 1st Canadian Armoured Personnel Carrier Regiment, to four squadrons, as discussed at the conference which was held on 9 October 1944, at Headquarters 21st Army Group, to discuss the formation of armoured personnel carrier units. 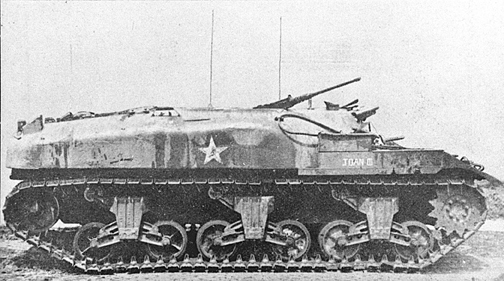 Although, as noted in “The ‘Ram’ Kangaroo armoured personnel carrier, Part 1,” the basis of the ‘Ram’ Kangaroo armoured personnel carrier, was that they were based on the conversion of Ram, Mark II tanks, to that of ‘Ram’ armoured personnel carriers, other conversions of Ram, Mark II tanks, were also ‘converted’ to Ram armoured personnel carriers. On 2 November 1944, First Canadian Army decided that it no longer required any further ‘Ram’ armoured gun towers17, be produced to met its needs. Therefore, on 18 December 1944, Canadian Military Headquarters (London)18 instructed No. 1 Canadian Central Ordnance Depot, Royal Canadian Ordnance Corps (Bordon Camp, Hampshire), that since there was no further requirement for ‘Ram’ armoured gun towers, that the decision had been taken to convert all ‘Ram’ armoured gun towers, currently held on stock by No. 1 Canadian Central Ordnance Depot, and those currently in the process of being converted to ‘Ram’ armoured gun towers, at No. 1 Canadian Base Workshop, Royal Canadian Electrical and Mechanical Engineers, located at Bordon Camp, Hampshire, be converted to ‘Ram’ armoured personnel carriers. 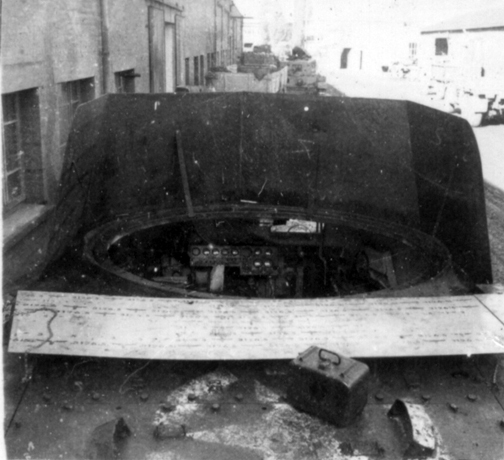 The initial conversion of Ram, Mark II tanks, to that of armoured gun towers, involved the removal of the complete turret, turret ring, and the internal ammunition bins, and the moving of the batteries up into the rear of the left-hull pannier, and the reinstallation of No. 19 Wireless Set, into the forward left-hull pannier. Stowage bins for 17-pounder ammunition, and a Tannoy loudspeaker system, were also installed, as was a towing hook on the rear, and one on the front hull. Therefore, their conversion to that of armoured personnel carriers, simply required the removal of the bins for 17-pounder ammunition, the Tannoy loudspeaker system, and the covering over of the drive shaft. The rear towing hook was to remain in place, while the front towing hook was to be removed, although this wasn’t always the case, as period photos show it still in place on some armoured personnel carriers. As a point of interest, during the initial conversion of Ram, Mark II tanks, to that of ‘Ram’ armoured gun towers, four hand grips (two on each side) were welded to the hull side to help the ‘gun detachment’19 in entering and existing the vehicle through the circular hole left in the hull top, by the removal of the turret. It is this author’s belief that these are the hand grips that are referred to in some contemporary accounts of the initial conversion of 100 Ram, Mark II tanks, to that of ‘Ram’ armoured personnel carriers, by No. 1 Canadian Base Workshop (for First Canadian Army), in August-September 194420, as also, are the covering over of the drive shaft. One draw back which was found from the conversion of ‘Ram’ armoured gun towers, to that of ‘Ram’ armoured personnel carriers, was that ‘Ram’ armoured gun towers, had been originally converted from earlier model Ram tanks that had the auxiliary turret, on the left front of the tank. When converted to armoured gun towers, and the No. 19 Wireless Set, was reinstalled into the forward left-hull pannier, it was found the wireless set protruded into the co-drivers position, due to the contour of the hull, and would not fit snugly into the forward left-hull pannier. This protrusion of the wireless set into the co-drivers position, made the handling of the auxiliary turret mounted .30-calibre Browning machine gun practically impossible. However a few ‘Ram’ armoured gun towers, converted to ‘Ram’ armoured personnel carriers, were issued to 1st Canadian Armoured Personnel Carrier Regiment, before the problem with the repositioning of the No. 19 Wireless Set was discovered. With 1st Canadian Armoured Personnel Carrier Regiment, having brought this problem to the attention of First Canadian Army Headquarters, they in turn, informed Canadian Military Headquarters (London), who in turn, advised No. 1 Canadian Base Workshop, Royal Canadian Electrical and Mechanical Engineers, the workshop responsible for conversions of ‘Ram’ armoured gun towers, to that of ‘Ram’ armoured personnel carriers. To remedy the problem, No. 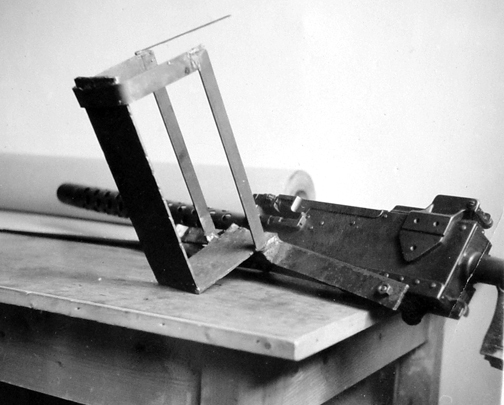 1 Canadian Base Workshop, in December 1944, produced a simple kit for mounting the No. 19 Wireless Set over the transmission, between the co-driver’s, and driver’s position. These kits were made available to 1st Canadian Armoured Personnel Carrier Regiment Signal Troop, for the repositioning of the wireless set in those carriers which had been converted from armoured gun towers, to that of armoured personnel carriers. This modification, was also incorporated into the conversion of armoured gun towers, to that of armoured personnel carriers, by No. 1 Canadian Base Workshop. To be continued in The ‘Ram’ Kangaroo armoured personnel carrier, Part 3. Lieutenant-General G.G. Simonds, normally the General Officer Commanding, II Canadian Corps, was appointed the Acting/General Officer Commanding-in-Chief, First Canadian Army, during the absence of Lieutenant-General H.D.G Crerar, General Officer Commanding -in-Chief, First Canadian Army, while he was away on sick leave in the United Kingdom, from 27 September to 9 November 1944. The Light Aid Detachment 1st Canadian Armoured Personnel Carrier Squadron, Royal Canadian Electrical and Mechanical Engineers, had been authorized on 28 August 1944, to support the 1st Canadian Armoured Personnel Carrier Squadron, Canadian Armoured Corps. Formerly the Second-in-Command of the 25th Canadian Armoured Delivery Regiment (The Elgin Regiment), Canadian Armoured Corps. Formerly of the 6th Canadian Armoured Regiment (1st Hussars), Canadian Armoured Corps. Formerly of the 2nd Canadian Armoured Brigade Signals, Royal Canadian Corps of Signals. Formerly the Officer Commanding the Light Aid Detachment 1st Canadian Armoured Personnel Carrier Squadron, Royal Canadian Electrical and Mechanical Engineers. 14 Advanced Ordnance Depot, Royal Army Ordnance Corps, was located in the Rear Maintenance Area of 21st Army Group, which at this time was located around the French city of Bayeux, in Normandy, and contained all the static administrative and maintenance units, supporting the Second British Army, and the First Canadian Army, which were the two armies that made-up the 21st Army Group. The unit officer responsible for the maintenance, repair and recovery, of a unit’s equipment. Formerly of the 25th Canadian Armoured Delivery Regiment (The Elgin Regiment), Canadian Armoured Corps. The ‘Ram’ Kangaroo’s 450-horse power Continental R975/C1 radial air-cooled 9-cylinder engine, required a thorough check after every 100-hours of operation. From I British Corps, and XII British Corps, respectively. Both components of First Canadian Army Troops. Which, on 2 February 1945, was redesignated the 31st Armoured Brigade. Also referred to as the ‘Ram’ 17-pounder Tower, had been developed in late 1943/early 1944, as a towing vehicle, to tow the 17-pounder anti-tank gun, which weighed 4,625-pounds (2,098-kilograms), and for the transportation of both the 17-pounder’s crew, ammunition, and associated equipment. Canadian Military Headquarters (located in London, England), held responsibility for coordinating the arrival, quartering, completing equipment requirements, and training of Canadian units and formations and to command and administer these units and formations in the United Kingdom and at base in the theatre of operations. In addition, the headquarters had an important liaison role, particularly liaison with the British War Office and with the General Officer Commanding Canadian Forces in the theatre of operations, as well as furnishing information to the Canadian High Commissioner in London. A ‘gun detachment,’ is the term used by the Royal Canadian Artillery for an artillery piece’s crew. See the ‘Ram’ Kangaroo armoured personnel carrier, Part 1, of 16 October 2014.